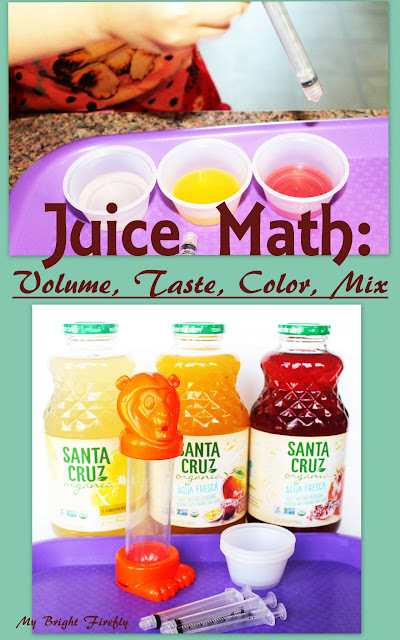 My Bright Firefly: Tasty Volumes of Juice: Measure Liquids Math Activities for Kids. Our introduction to volume was refreshing and fun. We used our senses to explore juice drinks, measured them, and created our new favorite mixes. STEM challenge: How the volume of juices effect the taste of the mixture? For these activities we used our new favorite juice drinks: Santa Cruz Organic. They are lightly sweetened, refreshing, and made with organic fruit juices and natural flavors. I received this product for free from the sponsors of the Green Moms Meet program who received it directly from the manufacturer. All experiences and opinions are my own. Notice and describe the colors: light and dark yellow and red. Discovering the fruits: observe the smell and taste, the ingredients the juice is made of. Reading the label: a short environmental print practice (we found the pictures of fruits and read some words that caught the eye). Guess the Taste game: one player closes eyes and takes a sip; then tries to guess the juice. Guess the Sugar game. We were able to find out that lemonade has more sugar than other juices; discussed how too much sugar is not healthy and brought a container of drinking water to the table. Introduction to volume and juice transfer activity. A new discovery: Juice (as any liquid) takes the shape of its container! A tray to collect spills, containers of different shapes and capacity, syringes and pipettes. Santa Cruz Organic Pomegranate Agua Fresca juice drink. It is red in color, contains organic pomegranate and lemon juice, 14g of organic sugar. Santa Cruz Organic Lemonade. It is light yellow in color, contains organic lemon juice and juice concentrate, organic natural lemon flavor, 22g of sugar. Santa Cruz Organic Mango Passion Fruit Agua Fresca juice drink. It is bright yellow in color, has a pleasant smell, contains organic mango puree, organic passion fruit concentrate, organic lemon juice and natural flavors, 14g of sugar. We found numbers 1 to 3 and letters "ml" on the syringe. Then we used syringes to measure the volume. Pictured below, since the cups are the same shape and size, and liquid takes the shape of its container, we can compare the volume and fill the cups to about the same volume in the cups. The art of juice drinks: how to make a perfect mix? How the volume of juices effect the taste of the mixture? And we are getting more creative with the flavors of drinks, mixtures, and popsicles - that is a fun (and hopefully ongoing) process for this summer!